St. Patrick heard the voice of the Irish calling to him, saying, "Come holy boy and walk amongst us again." May we also hear Celtic voices both past and present—the ancient lives, the immigrant ancestors, the modern day wayfarers—and learn from their stories. It is important to look to the past with clear eyes not clouded with the romantic outlook so prevalent in modern society’s love affair with all things Celtic. The early Celtic Christians had a harsh life, even those who did not choose it as the Skellig monks had. The world they lived in was wrought with wild animals, dangerous bogs that could swallow a traveler with one misstep, warfare and raids that could prove to be economically devastating if not deadly. When these people spoke and wrote about hope and joy in their spiritual world, I listen. They do not exaggerate. They did not have time for idealistic nonsense. They faced hardships I might never know in my life, and they embraced a relationship with God that was not dependent on the institutional church, a concept that at first look might seem extraordinary to us today. What is remarkable about these early Celtic Christians, besides their devotion and self-sacrifice, is the way they lived out their faith, shared it with others, saw God in creation and in other people. Thomas Cahill, author of How the Irish Saved Civilization, and others like him, told the world that it was the Irish who spread their faith without bloodshed. They were so successful that that fact alone deems them worthy of study. Like Burke said, we can learn how to move forward by first looking back. The lessons await, footsteps left by ancient Celts in manuscripts and in oral tales. How exactly did these people reach to the spiritual core of their own being in a way that so greatly affected others? That's a question I seek to answer, or at least explore, every time I write about them. 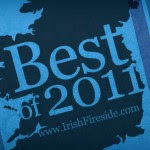 Click here to recommend Celtic Voices on Twitter! From Ireland or Of Ireland? ©2012 Cindy Thomson. Picture Window theme. Powered by Blogger.